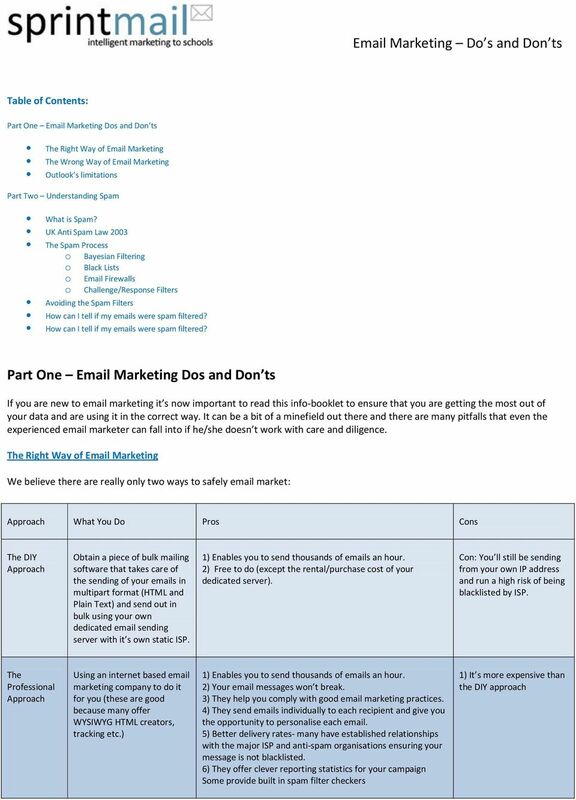 Download "Email Marketing Do s and Don ts A Sprint Mail Whitepaper"
3 The Wrong Way of Marketing Sadly many people think marketing is as simple as copying in a contact list writing a message, hitting send and making millions from the sales generated by that campaign. It isn t! Many small businesses tend to start their marketing lives sending to small lists of clients/customers from their Outlook account or their normal client (sometimes with attachments). This is ok if you re sending to 50-ish people once a month but if you are serious about getting results from your marketing campaigns then using Outlook as a sending platform needs to go out the window, now! 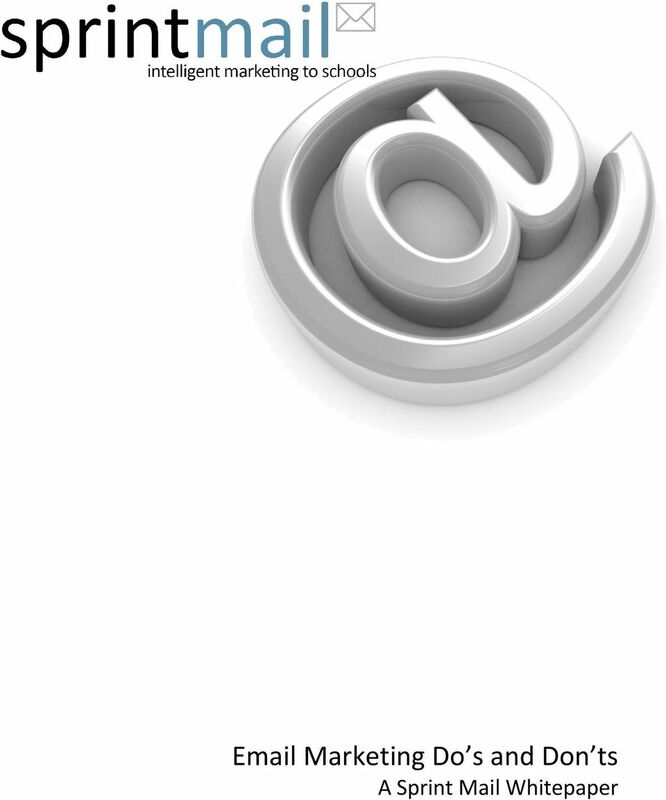 Outlook is simply not built for marketing (nor is Yahoo, Gmail etc.) One of the main problems that occur is that HTML newsletters break when someone without Outlook views them. By break we mean will not look the same/may have missing content/may not display pictures etc. Outlook s Limitations You can t send too many s from your own computer (your ISP will think you re a spammer and possibly block you). Most ISPs have built in quota limits that you can t surpass (if you attempt to send too many messages you ll get a message saying you ve reached your quota of sent message that day/hour (usually maximum of 500 per hour and 1000 per day). If they notice that you re regularly doing this they may shut you down. Sending too many large attachments will annoy your ISP and eat up your bandwidth (essentially the connection between you and your ISP that you pay for). Worst case scenario they ll shut you down. firewalls and ISPs don t like receiving too many s from one single IP address so you really need to throttle your delivery or ideally spread it across several IPs in the way an Marketing Company would do. (This is how we work at Sprint Mail). If you connect through your desktop you ll probably be connecting through your local ISP which will be a dynamic ISP. Unless you ve got a dedicated IP address set up with your ISP you ll be in trouble because ISPs and spam filters don t like receiving messages from dynamic IP addresses and will see you as spam. One common misconception with Outlook Users is that they can get around this sending volume problem by simply CC-ing people into a message. Be warned, if you do you ll face a whole new set of problems. It only takes one person to hit reply and then everyone on that list is ed and everything goes wrong! 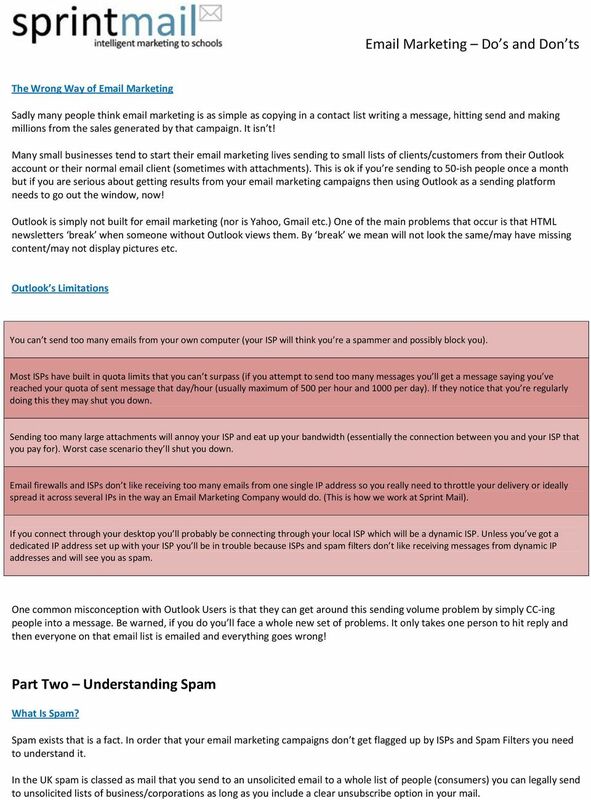 Part Two Understanding Spam What Is Spam? Spam exists that is a fact. 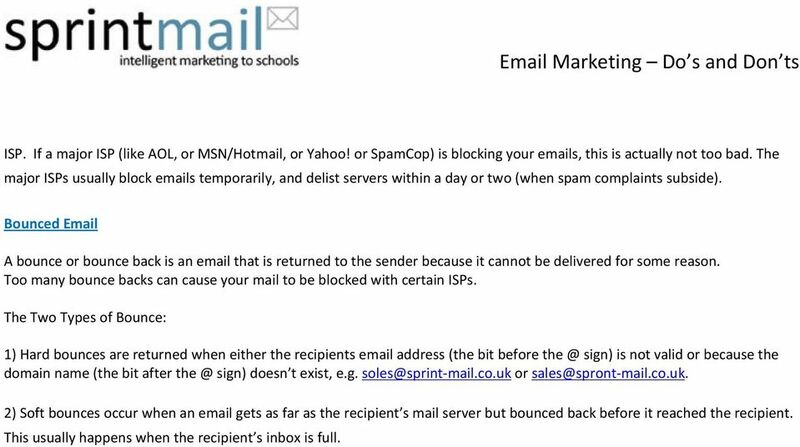 In order that your marketing campaigns don t get flagged up by ISPs and Spam Filters you need to understand it. In the UK spam is classed as mail that you send to an unsolicited to a whole list of people (consumers) you can legally send to unsolicited lists of business/corporations as long as you include a clear unsubscribe option in your mail. 4 UK Anti Spam Law 2003 Revised UK regulations will mean online marketers can send pitches and SMS messages only to consumers who have agreed beforehand to receive them, except where users are existing customers of a particular company. So, for consumers at least, the UK government is applying the 'opt-in' approach to regulating spam. Corporations can still be approached 'cold' with pitches but in these instances s must have an opt-out clause. The Office of the Information Commissioner will enforce the new regulations. Any breaches of enforcement orders issued by the Information Commissioner will be an offence liable to a fine of up to 5,000 in a magistrate's court, or an unlimited fine if the trial is before a jury. 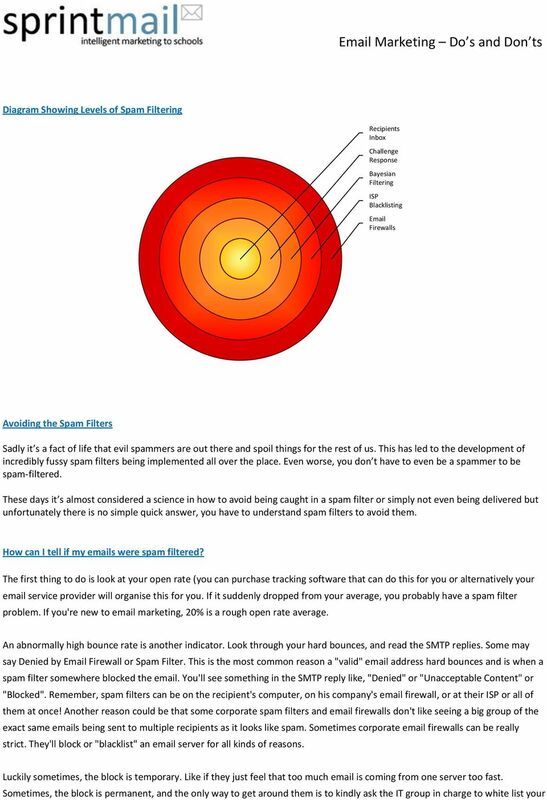 The Spam Process Bayesian Filtering This is a very important type of spam filter to know about as it s not used so widely and installed in so many applications these days (Outlook, Mozilla Thunderbird, and Apple Mail). Bayesian filters work by noting when users classify as junk (for example when they click a this is spam button). It reads the junk mail and then compares it with other s the recipient called junk, and looks for common traits in the subject line, the content, the hyperlinks, the sender, etc. Over time, Bayesian filters adapt and learn to find these traits in every message the recipient receives. Every time they find something that looks like spam they assign a measurable score to it. For example, using Free! might get you 0.7 points. Using colourful fonts may get you 1.5 points. Once an exceeds a threshold (set by the recipient), the is classified as spam, and thrown into the junk folder. Black Lists Many servers have started to track the IP addresses of the servers that sent them spam, and put them on blacklists. Every time they received from a server on their blacklist, it is deleted immediately. Servers also share their lists with other servers on the web and other servers add on to those blacklists. Web wide blacklists now exist with large ISPs syncing up with them. If you send that s very spammy you could end up on one of these blacklists and unfortunately once you make it on to a blacklist it s very difficult getting off. Firewalls Managing servers (and incoming spam, viruses, and phishing attacks) is a lot of work. Most large corporations these days install firewalls which handle their incoming . These can be described as the spam filter on top of a spam filters and they are very powerful and effective at stopping anything that looks even remotely spammy getting as far as the front door. 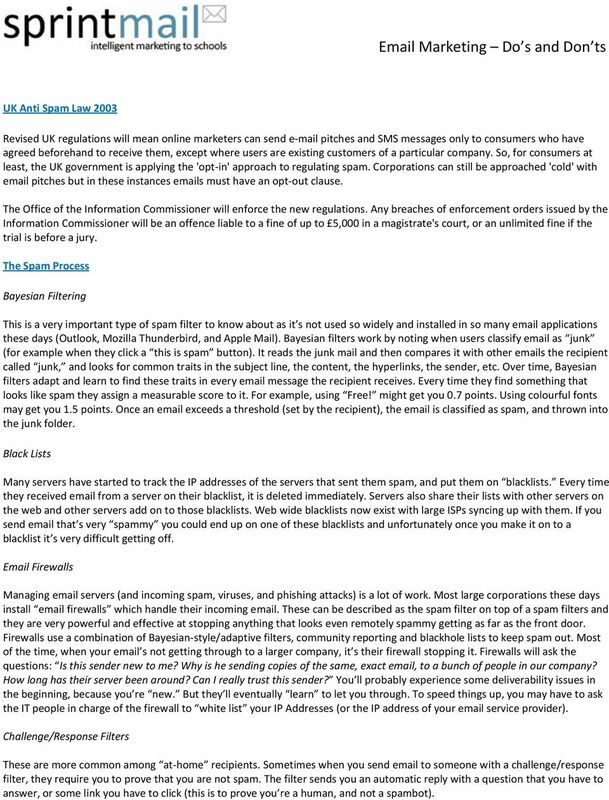 Firewalls use a combination of Bayesian-style/adaptive filters, community reporting and blackhole lists to keep spam out. Most of the time, when your s not getting through to a larger company, it s their firewall stopping it. Firewalls will ask the questions: Is this sender new to me? Why is he sending copies of the same, exact , to a bunch of people in our company? How long has their server been around? Can I really trust this sender? You ll probably experience some deliverability issues in the beginning, because you re new. But they ll eventually learn to let you through. To speed things up, you may have to ask the IT people in charge of the firewall to white list your IP Addresses (or the IP address of your service provider). Challenge/Response Filters These are more common among at-home recipients. Sometimes when you send to someone with a challenge/response filter, they require you to prove that you are not spam. The filter sends you an automatic reply with a question that you have to answer, or some link you have to click (this is to prove you re a human, and not a spambot). 6 ISP. If a major ISP (like AOL, or MSN/Hotmail, or Yahoo! or SpamCop) is blocking your s, this is actually not too bad. The major ISPs usually block s temporarily, and delist servers within a day or two (when spam complaints subside). Bounced A bounce or bounce back is an that is returned to the sender because it cannot be delivered for some reason. Too many bounce backs can cause your mail to be blocked with certain ISPs. The Two Types of Bounce: 1) Hard bounces are returned when either the recipients address (the bit before sign) is not valid or because the domain name (the bit after sign) doesn t exist, e.g. or 2) Soft bounces occur when an gets as far as the recipient s mail server but bounced back before it reached the recipient. This usually happens when the recipient s inbox is full. Being labeled as a spammer will drive your customers way, ruin your business, and can even get you a big fine or a jail sentence! So before you start blasting campaigns, check out these common mistakes that email-marketing rookies often make. EnterGroup offers multiple spam fighting technologies so that you can pick and choose one or more that are right for you. Amy wants to use her email to view some photos her friend Sandy sent, from her vacation to Washington DC. Whitelisting Help Many email service providers and internet service providers have SPAM filters to keep out the unsolicited email. Due to the volume of users we have, letsgolearn.com sends a lot of email. Since every email system is different we have included whitelisting instructions for a few popular email service providers below. What does it actually mean to warm up an IP address?